Inside, they left a sweet note on cute stationery, and they also included their business card! I love their business card design; it definitely shows off their style. All their products were safely tucked away in the bubble wrap. When I ripped off the tape securing the bubble wrap and unfolded the package, I was pleasantly surprised to find adorable packaging! The two necklaces were in a drawstring pouch, and the bow and ring were in a cute plastic baggie that said “Handmade for you.” I’m saving this bag; it’s so cute! In this package, I got a pink macaron necklace, a waffle bowl ice cream necklace, a pink drippy chocolate-and-sprinkles bow, and a bear drippy chocolate-and-sprinkles cookie ring. All of these items are super cute and have lovely detail! Both necklaces have a lobster clasp, which is my favorite type of clasp. I find it much easier to use than the spring ring clasp, and I always appreciate artisans who use the lobster clasp for their jewelry pieces. I truly love ALL of these jewelry pieces! It is difficult to choose a favorite, but if I really had to choose, I would pick the waffle bowl ice cream necklace as my favorite piece. The detail in this sweets pendant is impeccable. The waffle bowl looks realistic, the fudge looks perfectly chocolatey, and the cherry on top is an adorable touch. Red is my all-time favorite color, so I love seeing red cherries! The red really pops against the brown chocolate fudge. For my styling photos, you may recognize the coordinates from this previous review. Since I am a full-time college student (who also works two part-time jobs), I’m extremely busy. 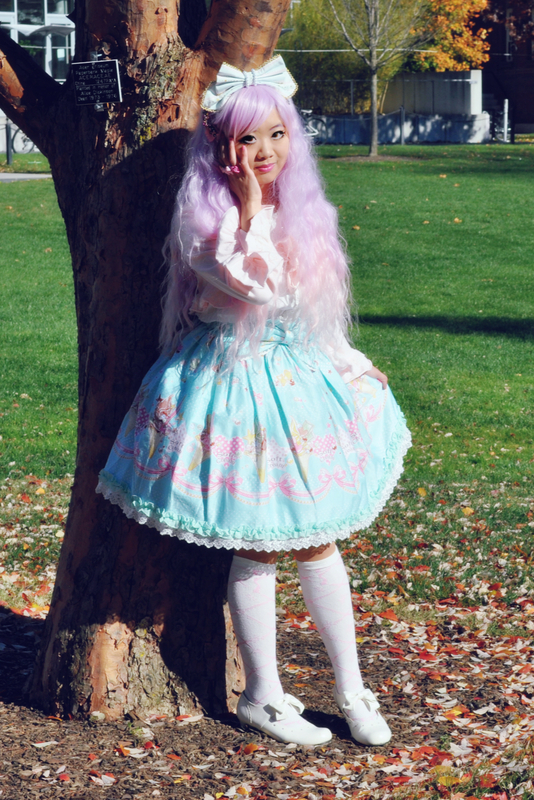 I do not have much time to dress up anymore, and I definitely don’t have time for many photoshoots alongside my studies. I tried to work different pieces together when I did these outfits. I think the different elements go well together, thank goodness! The detail on this bow is amazing! The chocolate actually does look drippy, and the entire bow is well-constructed. The chocolate and sprinkles are not loose. 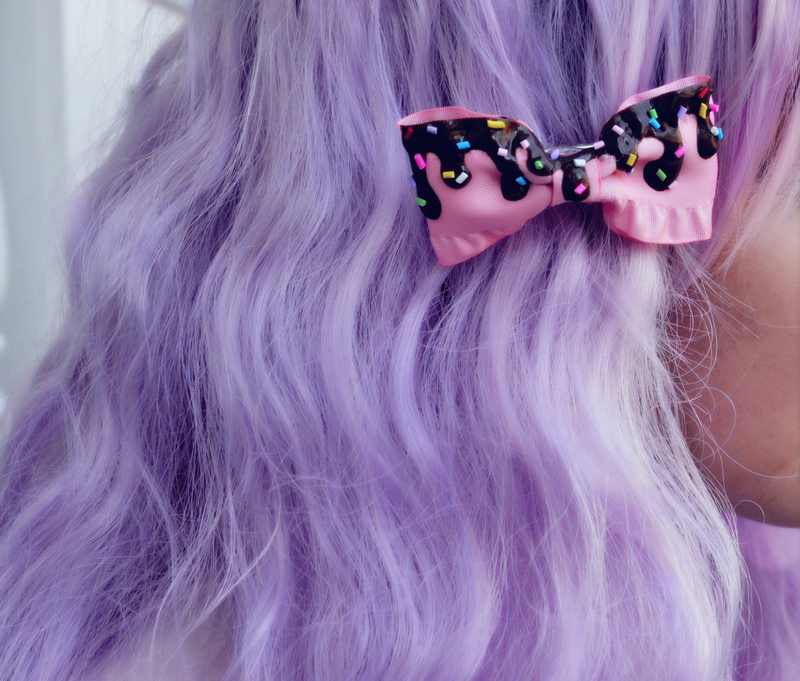 This is a very cute bow that can be worn for OTT coordinates as well as casual wear! 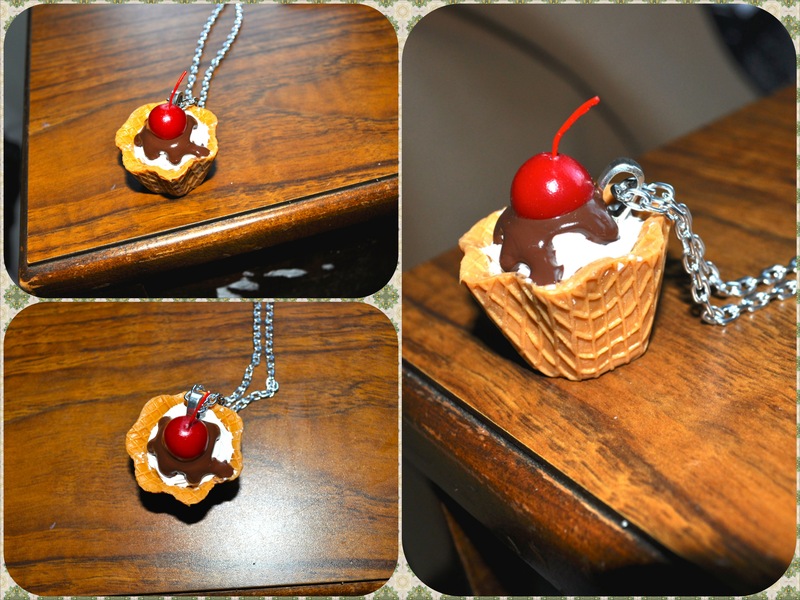 I wore the bow and the waffle ice bowl ice cream necklace with the above coordinate, but I can also wear these cute items to spice up casual pieces of clothing, such as jeans and a t-shirt. 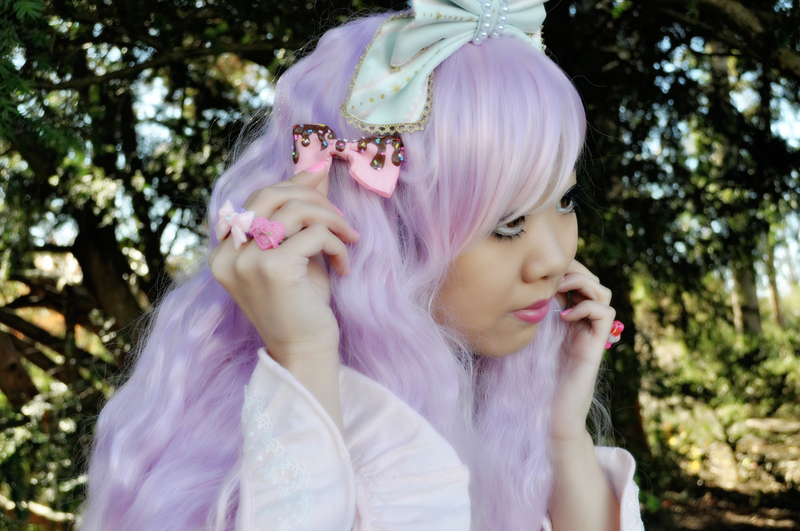 These accessories would also be perfect additions to a fairy kei outfit! 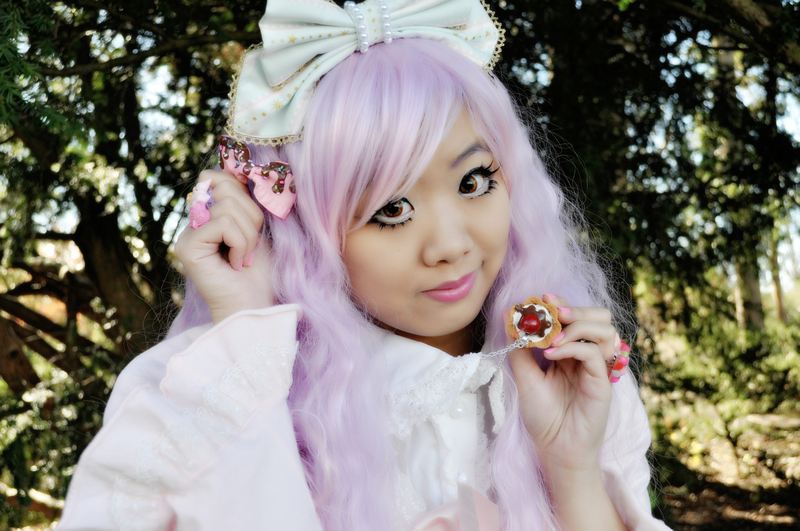 I also want to talk about this adorable macaron necklace! As you may already know, I loveloveLOVE macarons! This ring is a great size: it’s big enough to be easily noticeable, but it’s not too bulky. It’s very comfortable to wear, and the ring band is adjustable! I hope you enjoyed reading my review! Please check out Silly Sweet Shop; I am sure you’ll find items to fall in love with. 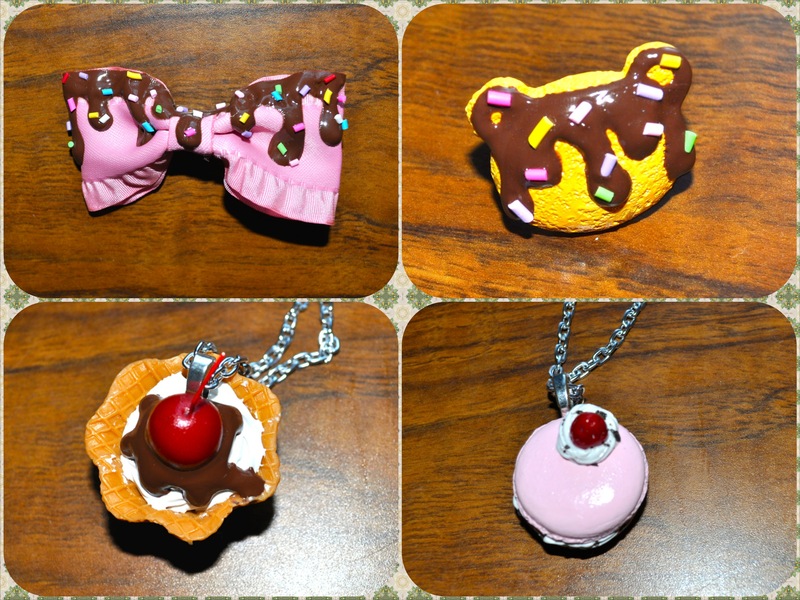 Here are links to the items in this post: Chocolate Sprinkle Hair Bow, Coco Bear Cookie Ring, Waffle Bowl Sundae Necklace, Strawberry Macaron Necklace. Silly Sweet Shop now has an Etsy store as well, so check that out too!